This 35ft Cabo Convertible powered by twin 3208 Caterpillar engines fishes out of the Papagayo Marina. 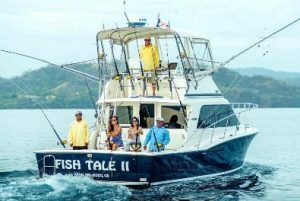 Captain Elario, with 15 years’ experience North Pacific fishing in Guanacaste, is at the helm, assisted by mate Gerardo. It sports an a/c salon; great seating and shade; a marine head; full electronics including Furuno radar and plot; Furuno color sounder; and a full range of brand new Penn International custom rods and Shimano TRS reels.